Sit-on-top kayaks, abbreviated as SOT, have become more popular in recent years. There are different reasons for their rise in popularity, including easy access, and the fact that the paddler has easy access on & off the kayak – which is a big deal for some people. What Is a Sit On Top Kayak, Why Choose One? We’re going to delve in further to find out more about sit-on-top kayaks. And we’ll hopefully help you decide whether or not a SOT is the type of kayak for you! As the name suggests, sit-on-tops are designed to be, well, sat on top of! The cockpit is out in the open and the paddler is not enclosed by a spray skirt or the shell of the ‘yak. One of the big advantages is just how easy it is to get on and off a SOT. Rather than having to loosen and tighten the spray skirt (also known as spray deck) around your waist. And having to climb in and out of a lowered cockpit, you can just step onto and off sit-on-top kayaks much more easily. They're also easier to climb on and off of from the water. A lot of people love to go swimming off a sit-on-top due to the fact they are so easily accessible. This can be a big one for some people. Because sit-on-tops have an open air cockpit, the paddler may not feel as restricted as someone in an enclosed space. This is often exacerbated by thoughts of rolling over and being trapped under water. Most types of kayaks are pretty stable and it actually takes quite a lot to capsize. However, if you do, a sit-on-top can very easily be mounted from the water in which you were dumped. In actual fact, enclosed cockpits are pretty safe too, but if you do leave your cockpit (and not Eskimo roll), they are harder to get back into again (compared to a SOT). If you're out on a hot day, you're going to be glad you aren't enclosed in a covered cockpit. Aside from perhaps having a small hatch to keep stuff dry, everything you carry will be out in the open. This means there are less restrictions as to what you can carry. Want to bring a tent, or lots of fishing gear? You won’t have an enclosed cockpit limiting the size of the gear you want to carry. A SOT is going to be able to carry more than perhaps a sit-in-kayak. This is another biggie. And it’s going to depend on where you are in the world. In fact, the climate of where you are is probably going to determine whether or not a SOT is for you. SOTs openly expose you to nature’s elements. If it’s cold outside, you’re going to feel cold, especially if it's windy. And, given that you’ll be paddling all the time, you may end up inadvertently paddling the contents of the river, lake or the stream onto your body. Now, if you’re in a hot or warm climate, this might not bother you too much. In fact, if it’s really hot, this might be pleasurable! But in cooler climates, getting wet isn’t much fun. So this reason alone could push you to go for a sit-in-kayak based on the above. However, there are some awesome wetproof (and dryproof) suits around today, and they will help you to feel more comfortable, even in the cold and wet. > Drip rings can help! Sitting out in the open means that Eskimo rolling is out of the question. The thing is, it isn’t really relevant in this situation. SOTs are generally less likely to roll anyway. And as we said before, even if you do, they are so much easier to clamber back on board again. One thing that should be noted. Oftentimes sit-in kayaks can offer better support leg support when trying to paddle fast. Although some of the newer SOTs certainly give the sit-ins a good run for their money! ​Leg support and a lower center of gravity also mean you have more control using a sit-in. Sit-on-tops are fully exposed to the elements. So please, please, please make sure you have a good sunscreen applied to exposed areas of your body. If you’re out paddling around, having fun exploring, fishing or taking a swim, it is so easy to lose track of time and forget about this basic ritual. Depending on where you are in the world, and your tolerance to the sun, your skin can get burnt in just a few minutes. Before you even step onto your SOT, apply plenty of sun cream, and make sure it is of a high factor (factor 30 or higher – bare minimum). Even if it’s cloudy, you can still get burnt, and burnt bad! Given the fact you will be sitting on top of water all the time, which reflects the sun’s rays back onto you, sun cream is very important. Check the cream’s guidelines, but generally the cream should be applied every 2 hours or so. Make sure you do this, especially if you go swimming as part of your paddle! Here are five of the best SOT kayaks around at the moment. Everyone’s needs are different, so plough through the following to see what might suit you best. One of the more popular kayaks out there. The Frenzy is a great all-rounder. Because it is so stable, and tracks well (with its Tri Form hull), beginners have a liking for it. That’s not to say that more advanced paddlers wouldn’t enjoy it as well! It comes with a removable padded seat with back support. It can also be adjusted, which is ideal for those longer paddling sessions. At only 43lbs, this 9ft kayak is one of the easier hard-shelled ‘yaks to transport around. It has handle at the bow and stern and on both sides. There are no dry storage areas unfortunately. However, there are 2 strapped sections, front and rear. You’ll also need to buy paddles separately, as they do not ship (no pun intended) with the Frenzy. This offering from Perception tracks well and is stable under moderate conditions. More suited to light rivers and lakes. There is a large dry storage compartment on the bow with cover. There’s a second open storage area at the rear, with shock cords – and another small covered hatch. There are straps to secure the paddles when not used. The R15 Pescadors 100 can be carried around pretty easily and supports weight up to 325 pounds. It comes with a padded seat and separate padded backrest. There is a storage area at the stern (rear) with a cover to go over the top. There are also molded paddle holders and handles on the side to make carrying around easier. The biggest reported problem with this cheap SOT is that stability & tracking isn’t the best. If you’re just paddling around leisurely on relatively flat waters, you should be fine. But if you’re powering ahead then the tracking issue can increase in intensity. The Old Town Twister can be an ideal recreational yak for using at the beach, as well as lakes and rivers. It’s designed to be easy to use and could be a good choice for families with kids or anyone learning to paddle, as it has a spacious, open seating area that can be easy to climb in and out of. It has a molded seat and footrests and there’s space to bring along some gear with the bungee storage deck behind the seat. It also benefits from having a built-in cup holder and a paddle holder to keep your paddle safe if you want to jump on and off for swimming. This is a stable, lightweight craft that’s also durable and has the added benefit of a skid plate to help protect the keel if it’s dragged along the ground. The Tarpon 120 is a 12 foot sit-on-top with a high weight capacity that could be a good choice for larger paddlers, or if you plan to head out with a lot of gear. There is plenty of room for your gear, with a large storage deck with bungee cords at the stern and a large storage hatch at the bow. There’s a second, smaller storage hatch in the center that can be useful for small accessories or valuables. The Tarpon has a padded, slightly elevated seat, which can make longer paddling trips a little more comfortable. While this can be a great craft for a camping trip, it can also be ideal for fishing, with gear tracks along the sides so you can attach rod holders or gadgets. 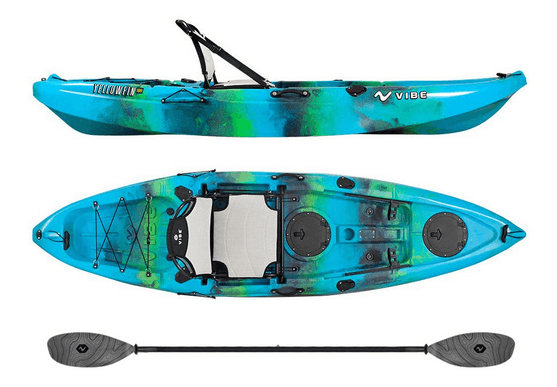 This yak is built for stability and maneuverability and can be a good choice for a range of water types, from flat water to rivers and oceans. The Vibe Yellowfin is a 10 foot sit-on-top that is built for stability. With its short, wide hull it can be easy to maneuver, as well as transport, which could make it a great choice for beginners, or if you’re looking for a compact, convenient fishing vessel. Despite its compact size, it actually has a pretty high weight capacity of 375 pounds, which can be useful if you’re planning to haul heavier fishing gear. But it can be equally handy if you’re a larger paddler. The mesh fabric seat is designed to be sturdy and can be adjusted. It also allows you to sit a little higher, giving you improved visibility. As for storage, there’s a storage well at the stern with bungee cords for security and there are two sealed hatches with bag inserts so you can keep small items safely stored. Another benefit of this craft is that it has four rod holders, so it’s ready to be rigged with your gear. It also comes with a paddle, meaning you can get out on the water right away, whether you’re fishing or exploring. This offering from Sun Dolphin, is a 10ft kayak with more storage options than the others. Yes, there is a dry storage area at the stern end. So you can keep everything you don’t want to get wet in here with the cover attached. Yes, there is also a small open storage area at the bow (front end) which has shock cord to hold any kit you have down. But Sun Dolphin have also included a ‘Portable Accessory Carrier’. The PAC is used as a third method of storage and basically ties onto the rear of the kayak and floats behind. Sweet! The seat is padded, and so are the edges of the cockpit to help protect the thighs. Also comes with an adjustable foot brace and a paddle holder when you just want to chill out. Be careful with weight. Up to 250 pounds is officially supported, so be careful when loading up. There are alternative kayak lengths available in the Sun Dolphin ‘Bali’ range. If you’re looking for a tandem sit-on-top kayak, the Lifetime Manta is one that should be on your final comparison list. It weighs in at 60lbs, which isn’t too bad for a hard shelled tandem kayak. It can accommodate up to 500 pounds in weight, so it’s got plenty of strength under that bright yellow guise. Paddles and backrests come packed with this tandem SOT. Always good for those who don’t want to run around buying accessories that they absolutely need for a kayak. There is in fact room for a 3rd person in the center of the ‘yak, which would be best suited for one of the kids. Or you could use it as an extra storage area. The bow end also has a dedicated storage area. This is where you can keep bits and pieces under the shock straps. Also included are drinks and rod holders. So, if you’re up for a long day of chilling out or a spot of fishing, you have options here.